L I V I A: [GET THE LOOK AT HOME: REBECCA VALLANCE] FEAT. ST TROPEZ SELF TAN LUXE DRY OIL - FULL REVIEW! [GET THE LOOK AT HOME: REBECCA VALLANCE] FEAT. ST TROPEZ SELF TAN LUXE DRY OIL - FULL REVIEW! If you guys missed the MBFW 16' featuring St. Tropez and Rebecca Vallance get the latest scoop here. Michael Brown (St. Tropez Skin Finishing Expert) stated that "The Rebecca Vallance body was all about glowing, healthy skin. Using the St. Tropez Luxe Dry Oil, skin tone was lifted rather than a dramatic change, as the oil gave optimum nourishment and high impact runway sheen." Self-tanners are a must when winter approaches. There's no way I can achieve a natural tan at the beach with the temperatures dropping like crazy all right through parts of Sydney. 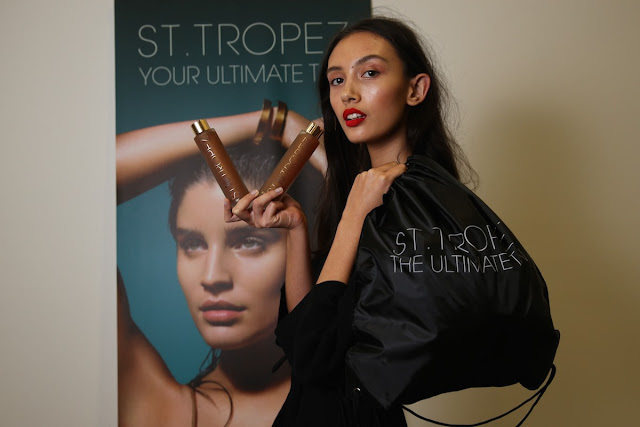 So this one time, I looked to check out St. Tropez Self Tan Luxe Dry Oil, which is known for being long-lasting on the skin. The Self Tan Luxe Dry Oil is known for being the most innovative, self-tanning solution for where it helps to deliver a long-lasting, streak free and natural looking tan. The product is presented in a gorgeous, frosted-glass flacon which offers 100% natural Neroli, Lemongrass and Grapefruit essential oil fragrance that smells luxury and amazing. (There are no harsh scent whilst looking to apply this self-tanner on which is why this is going to be my ideal type of tanning product moving forward). The formula of the self-tanner is very fast drying, non greasy and so easy to apply on as it's in the form of a dry-oil base, After applying on the self-tanner, I found my skin feeling soft, nourished and very supple feeling. This is supposedly to last for up to seven days which is perfect if you're wanting a long-lasting natural tan for about a week. One the tan has fully developed, you can look look to wash off the subtle shimmer that acts as guide colour to reveal a golden tan. 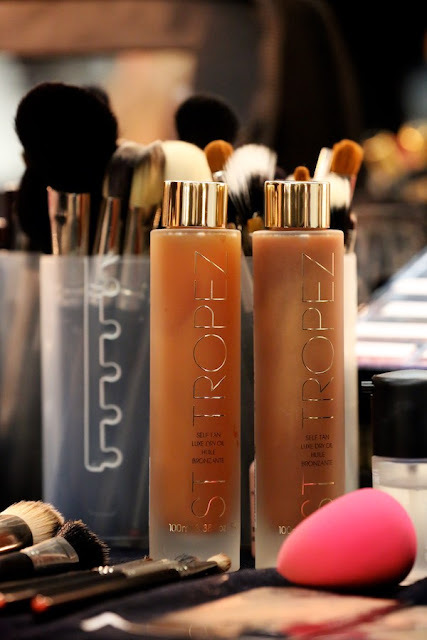 Addition to all of the benefits as mentioned above, the St. Tropez Self Tan Luxe Dry oil uses a 100% natural tanning agent and is also paraben, sulphate and phthalate free. The Self-tanner was quite easy and straight forward to use. I am in love with the product packaging as it feels luxury and durable to hold. And of course, I cannot get over the amazing scent that combines Neroli, lemongrass and Grapefruit which all makes it feel like a luxurious experience as it doesn't smell like other self-tanners that I have used in the past. It feels so gentle on the skin and dries really quickly which is quite ideal for me. The fact that it's super lightweight to use on the skin, really makes me want to use this on a weekly basis. STEP 1 - For smooth skin, look to prep with St. Tropez Tan Enhancing Body Polish. STEP 2 - Look to drench the St. Stropez Applicator Mitt with the Self Tropez Self Tan Luxe Dry Oil, and then apply a generous coat all over the body. Wait three minutes and repeat with another coat. STEP 3 - Resist the urge to pat it dry, instead leave the oil to dry naturally in order to achieve a nice glowing gleam. Overall, I am so happy with the natural tanned look that has developed over the few hours. It leaves a healthy and radiant glow, whilst also leaving my skin feeling nourished too. Incorporating the St. Tropez Self Tan Luxe Dry Oil as it's super fast and lightweight to apply onto the skin. 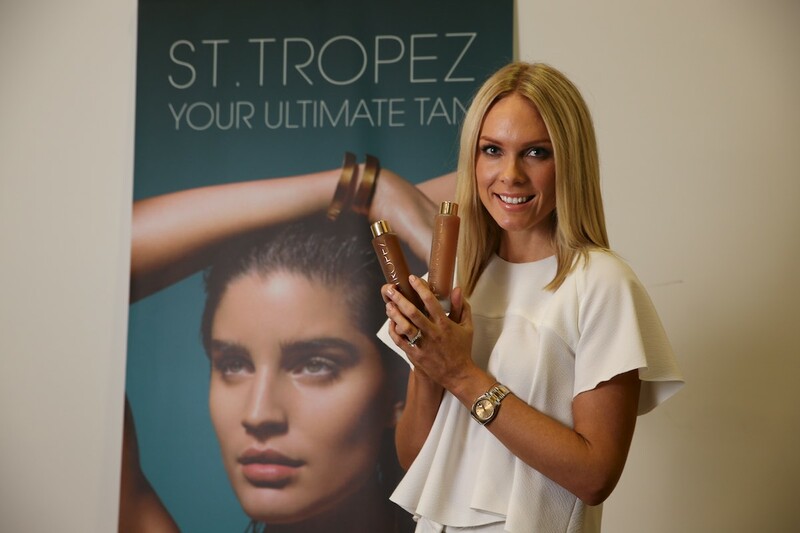 Have you checked out the Self Tan Luxe Dry Oil by St. Tropez as yet? Thank you ST TROPEZ for supporting me for this review. My reviews are based on my personal and true experiences. I only recommend products that I truly support.